Tech news: VR update and "Netflix for live music"
Could spider venom help stroke recovery? Selling power to the people, a Netflix for live music, tracking dementia patients, the best way to shuffle cards, and could spider venom help stroke recovery? From Cape Reinga to Bluff, electricity does the same thing whenever and wherever it comes out the plug. So how do you decide who to buy it from? George Block from consumer.org.nz has been looking at New Zealand's increasingly crowded electricity market and whether greater competition is translating into better deals for consumers. Powerswitch is a tool to help you work out if you're getting the best deal. Flick Electric Co. (139% growth in 2016, 9884 new customers in 2016) has a single electricity tariff based on the spot price of power, which varies every half-hour. Flick customers can use its free app to monitor spot prices and measure their consumption in terms of carbon emissions. Flick is available everywhere in New Zealand as long as you have a smart meter. As with all retailers a low fixed charge option for low users is available. No fixed-term contracts or break fees. Paua to the People (4979% growth in 2016, 448 new customers in 2016) is the only retailer besides Flick currently offering a spot-based tariff. Whereas Flick is a classic example of an ambitious start-up, Paua is a more low-key operation. Run by a couple from a villa in Wellington’s northern suburbs, Paua’s never placed an ad, offers email-only (though 24-hour) customer service and doesn’t have an app. The upshot is miniscule overheads, meaning it’s able to offer slightly lower rates than Flick. Paua also offers a traditional flat rate per kWh plan in addition to spot pricing. At present, it only serves Wellington consumers with a smart meter. No fixed term contracts or break fees. Electric Kiwi (874% growth in 2016, 5999 new customers in 2016) offers a flat rate but lets you nominate an hour of free power each day during off-peak times (9am to 5pm and 9pm to 7am). Chief executive Luke Blincoe says Electric Kiwi won’t raise prices this year. It guarantees you’ll save in your first year compared to your previous retailer or it will credit you the remainder. Customer service is email- and livechat-only. Available throughout New Zealand as long as you have a smart meter. No fixed-term contracts or break fees. Ecotricity (405% growth in 2016, 947 new customers in 2016) the country’s only “carbonZero certified” electricity retailer, meaning it offsets all carbon emissions from its operation by investing in renewable energy and electric vehicles. It also only enters into contracts with generators of renewable energy. Unlike many smaller retailers, Ecotricity will buy back power from grid-tied solar PV systems. Its solar buyback rates are comparable to the big five retailers (approximately 7c/kWh). Offers contracts with a three-year energy price freeze. Available throughout New Zealand as long as you have a smart meter. Wise prepay energy (860% growth in 2016, 1908 new customers in 2016). a prepaid electricity service requiring no deposit, credit check or fixed contract. Aimed at those who have been disconnected by other powercos. If your balance hits $0 your lights will go off that same day. Offers a customer-only app to monitor your balance, power consumption and top-up your account. Has traditional low and standard user flat rate plans. Available in Auckland, Hamilton, Hawke’s Bay and Wellington as long as you have a smart meter. P2 SolarShare (152% growth in 2016, 79 new customers in 2016). New Zealand’s only “peer-to-peer” energy provider. Attracts customers with grid-tied solar PV systems with significantly higher buyback rates for their surplus energy than other retailers (16c/kWh vs. around 7-8c/kWh for other retailers). Offers its non-solar customers cheaper power when solar customers are feeding surplus energy back into the grid (14c vs 18c for grid power when no solar is available). Allows you to support solar if you’re a renter or otherwise lack the ability to invest in a system. Guarantees 7% of your power will be charged at the lower solar rate, but only during summer No fixed term contracts or break fees. Only available on Auckland’s Vector network. Electra Energy (103% growth in 2016, 538 new customers in 2016). operated by Kapiti-Horowhenua lines company Electra and only services customers in that region on the Electra network. Offers a fairly standard suite of fixed and day/night tariffs. Customer-owned with profits going back into the community. No smart meter required. megaENERGY (92% growth in 2016, 2960 new customers in 2016). Services the Auckland region with a standard suite of fixed rate plans. Targeted at the Asian market with customer support in Korean, Chinese and English. Bundled landline, broadband, mobile and TV streaming plans, in addition to electricity, are available from parent company megaTEL. Offers free smart meter upgrades. Opunake Hydro (91% growth in 2016, 490 new customers in 2016). Retails electricity in Taranaki generated from its hydro station in Opunake and two gas-fired generators near Stratford. Plans are geared at consumers who use relatively large amounts of energy: 15,000 to 50,000kWh/year, equivalent to a large home,a small-sized business or farm. Payless Energy (31% growth in 2016, 179 new customers in 2016). Dunedin-based retailer catering to residential and industrial customers throughout Otago and Nelson, and currently expanding into Southland. Offers traditional, though competitively priced flat rate and day/night plans. No fixed-term contracts. No smart meter required. Pulse Energy (5% growth in 2016, 2939 new customers in 2016). Community-owned retailer offering electricity and gas (both natural and LPG) nationwide. Offers a plan with a commitment not to increase your bill at greater than an agreed fixed rate for three years. 30-day notice required before switching but no contract break fees. Pulse also operates Grey Power Electricity, available to members of Grey Power. Tech correspondent Peter Griffin has been at a VR conference in Wellington looking at some cool applications for the technology in art and filmmaking. Also, Google wants you to share your location data with you friends so they know where to meet you. And a new concert subscription service called Jukely, which has been dubbed 'Netflix for live music'. For the 50,000 people living with dementia here in New Zealand, getting disorientated or lost is a major issue. If they're not found within 24 hours, these people can end up seriously injured or even dead. And with the number of people diagnosed with dementia predicted to triple by 2050, the issue is only going to become more acute. Now some simple locally designed technology - previously used to track kiwis in the wild - is helping tackle the problem by finding people more quickly without tying up so many resources. Auckland Police Search & Rescue co-ordinator Sargeant Dene Duthie, Delanie Halton of the WanderSearch Auckland Charitable Trust and WanderSearch user Joan Lilly walk Simon Morton through the system. Riffle shuffle or overhand? What's the best way to shuffle playing cards? Professor Graham Kendall is a mathematician studying blackjack, roulette...and packs of cards. 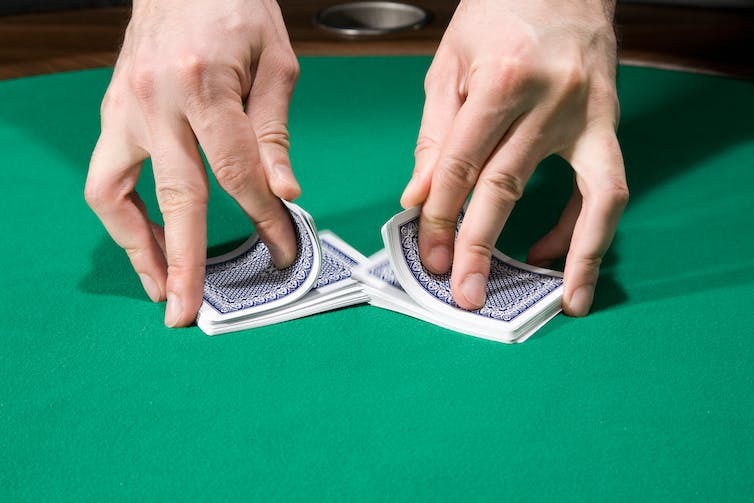 Card Counting and Shuffle Tracking in Blackjack. To work out how many ways there are of arranging a standard 52-card deck, we multiply 52 by all the numbers that come before it (52 x 51 x 50 … 3 x 2 x 1). This is referred to as “52 factorial” and is usually written as “52!” by mathematicians. The answer is so big it’s easier to write it using scientific notation as 8.0658175e+67, which means it’s a number beginning with 8, followed by 67 more digits. In theory, you could shuffle a deck so that the cards emerged in number order (all the aces, followed by all the twos, followed by all the threes and so on), with each set of numbers in the same suit order (say spades, hearts, diamonds and clubs). Most people would not consider this random, but it is just as likely to appear as any other specific arrangement of cards (very unlikely). This is an extreme example but you could come up with an arrangement that would be seen as random when playing bridge because it offered the players no advantage, but wouldn’t be random for poker because it produced consistently strong hands. The Best (and Worst) Ways to Shuffle Cards - Numberphile. Persi Diaconis is a mathematician who has been studying card shuffling for over 25 years. Together with and Dave Bayer, he worked out that to produce a mathematically random pack, you need to use a riffle shuffle seven times if you’re using the variation distance measure, or 11 times using the separation distance. The overhand shuffle, by comparison, requires 10,000 shuffles to achieve randomness. “The usual shuffling produces a card order that is far from random,” Diaconis has said. “Most people shuffle cards three or four times. Five times is considered excessive”. So next time you’re at a casino, take a look at how many times the dealers shuffle. The cards may not be as random as you think they are, which could be to your advantage. The venom of one of the world's most dangerous spiders can protect brain cells after a stroke, a team of Australian researchers has found. Stroke, which involves an interruption of the blood supply to the brain causing the destruction of tissue in the affected area, is the second-leading cause of death worldwide and a major cause of long-term disability. Dr Chris Smith of The Naked Scientists told This Way Up's Simon Morton that when a stroke occurs nerve cells are damaged when they are deprived of oxygen, and this leads to an accumulation of acid that can't be flushed away. This increased acidity triggers pores (acid sensing ion channels or ASICs) sitting in the nerve cell membrane to open, flooding cells with sodium and water that causes them to swell and burst. So if you can stop the ASICs responding in this way, it could buy stroke patients extra time for treatment before further damage occurs. Now in a study published in the journal PNAS, University of Queensland researcher Glenn King and his colleagues have found that the venom of the infamous funnel web spider contains a protein called Hi1a that can block the main ASIC pore, and shows promising results in studies on rats and on cultured cells in the lab. "Encouraging as this sounds, commentators are taking a cautionary stance", Dr Smith said. "They point out that rats are not humans and the current results explore only very short time intervals following the stroke". The researchers will now see if these beneficial effects are maintained and translate into superior recovery and neurological function over a longer time span.